Today you are hearing from Ben Roosa, AmeriCorps Outreach Coordinator for the New York Field Office. Ben enjoys sharing his love of exploring science and nature with others. Since 2010, the New York Field Office has been hard at work improving habitat at the Rochester Embayment Area of Concern in Rochester, NY. With funding from the Great Lakes Restoration Initiative, we conducted wetland habitat assessments in the area and found a major lack of diversity, both biological and physical, in some of the wetlands. Cattails and a select few other plant species ran rampant, crowding out other plants, invading open areas, and nearly covering the entire wetland. The result was a simplified ecosystem with few species and limited diversity of physical habitat. By contrast, a complex, healthy wetland would generally have a mix of open water and vegetation with the plants being a variety of different types and heights. With the results of the assessments, NYFO identified several areas to focus on and developed plans to restore these areas to happy, healthy wetlands. These great videos produced by Birds Eye View LLC provide an aerial fly-through of two of the restoration areas, Long Pond and Salmon Creek. The Long Pond video starts on the east side of the pond, showing wetland potholes which were excavated within the cattail-dominated wetland and habitat mounds made from the excavated material. The wetland potholes and habitat mounds are specifically designed to be of varying size and depth/height so as to increase habitat diversity. The habitat mounds were seeded with a wetland plant mix and planted with native tree and shrub species. At the 36 second mark, the video then shows potholes and habitat mounds created along the west side of Long Pond, on both sides of Northrup Creek. In total, 9 acres of potholes were created in the once expansive cattail wetland in Long Pond. The Salmon Creek video starts by moving towards a pothole created on the right and habitat islands created on the left (diamond shaped areas). The habitat islands were created to isolate the stands of cattail. The islands will be treated with herbicide after the bird nesting season and will then be seeded and planted with native species. The video then continues past the first pothole and the habitat islands to show channels excavated in the wetland and the potholes and habitat mounds created on both sides of an embayment to Salmon Creek (the water surrounded by undisturbed cattails). The channels allow northern pike (Esox lucius) access to spawn in newly created wetland habitat. In total, 5 acres of potholes were created, approximately 2,200 feet of channel were excavated, and approximately 0.3 acres of cattail control islands were created. This entry was posted in Blog entries, Habitat restoration, Partnerships and tagged aerial, conservation, New York, rochester, video, wetlands on April 25, 2016 by usfwsnortheastblog. The pernicious perennial pepperweed plant is a fun tongue twister (repeat it 10 times), yet this coastal invader is no laughing matter. Native to Europe and Asia, it is classified as a noxious, invasive weed in 15 states, including Massachusetts and Connecticut, and outcompetes native salt marsh grasses, which help to filter stormwater pollutants, buffer against storm damage, provide habitat to fish and wildlife and support recreational and commercial activities for local towns. 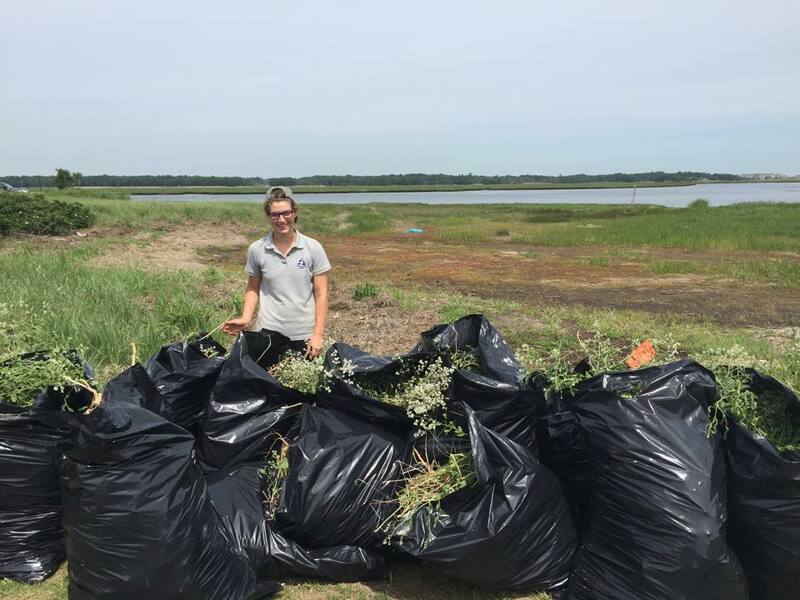 Since 2006, The Great Marsh Perennial Pepperweed Eradication Project has worked with numerous volunteers who have pulled thousands of pounds of pepperweed, or Lepidium latifolium, from the Parker River National Wildlife Refuge in Newburyport, Massachusetts, and surrounding areas. With the help of many local partners such as Mass Audubon and local schools, more than 70 sites have been restored and counting. 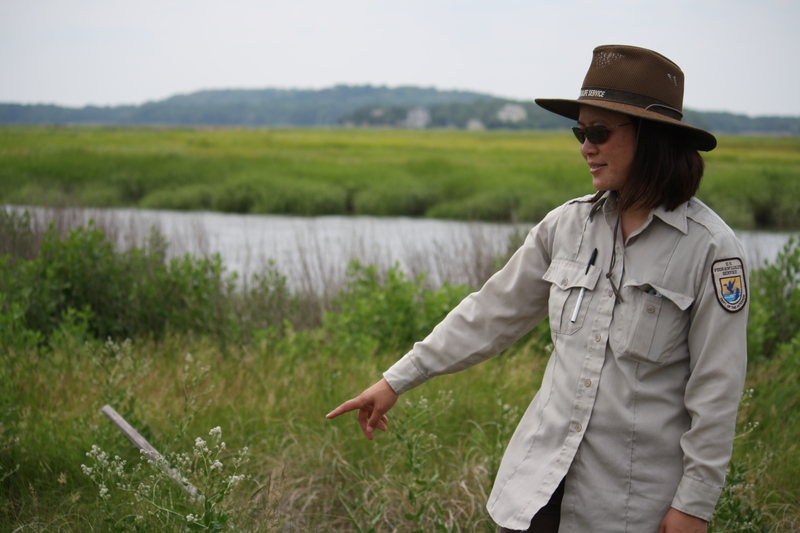 Nancy Pau, wildlife biologist at the refuge, says supplemental recovery funds from Hurricane Sandy cover treatment of almost 100 percent of the pepperweed, where past funds only covered between 60 to 70 percent of the treatment needed. For the past two years, the River Valley Charter School has helped Parker River National Wildlife Refuge staff battle dense stands of this aggressive mustard family plant, pulling pepperweed from 4.7 acres along the Plum Island Turnpike and along Plum Bush Down, a small residential area along the Great Marsh in Newburyport. 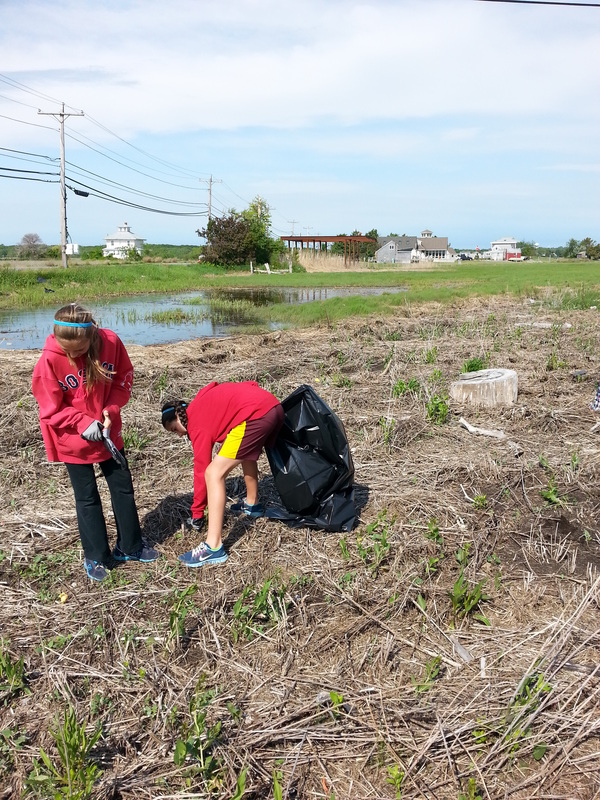 Last month, nearly two dozen 4th, 5th and 6th graders from the school held a repeat performance from the year before, pulling 15 large garbage bags full of plants from six areas where pepperweed control is badly needed. And that’s a perfectly good reason to publicize the peeps pulling pepperweed. This entry was posted in Blog entries, Coastal Restoration, Invasive species, National wildlife refuges, Partnerships, Strong After Sandy, Youth and tagged #StrongAfterSandy, coastal, GOMI, Gulf of Maine, Gulf of Maine Institute, Hurricane Sandy, Hurricane Sandy resilience project, Mass Audubon, Massachusetts, national wildlife refuges, parker river, Parker River National Wildlife Refuge, salt marsh, The Great Marsh, wetlands, youth, youth engagement on July 10, 2015 by margiebrenner. One of largest segments of tidal marsh on the Atlantic Coast — known as the Great Marsh — is receiving the equivalent of an extreme makeover thanks to Hurricane Sandy recovery and resilience funding. Like adding support beams to a home’s foundation, this landscape-wide renovation will enhance the ability of salt marsh to withstand future storm surge and sea-level rise, offering added protection for wildlife habitat and coastal communities. The entire Great Marsh is the largest contiguous salt marsh in New England, stretching from Cape Ann, Massachusetts to New Hampshire. It includes over 20,000 acres of marsh, barrier beach, tidal river, estuary, mudflat, and upland islands extending across the Massachusetts North Shore from Gloucester to Salisbury. On a recent visit to Parker River National Wildlife Refuge, U.S. 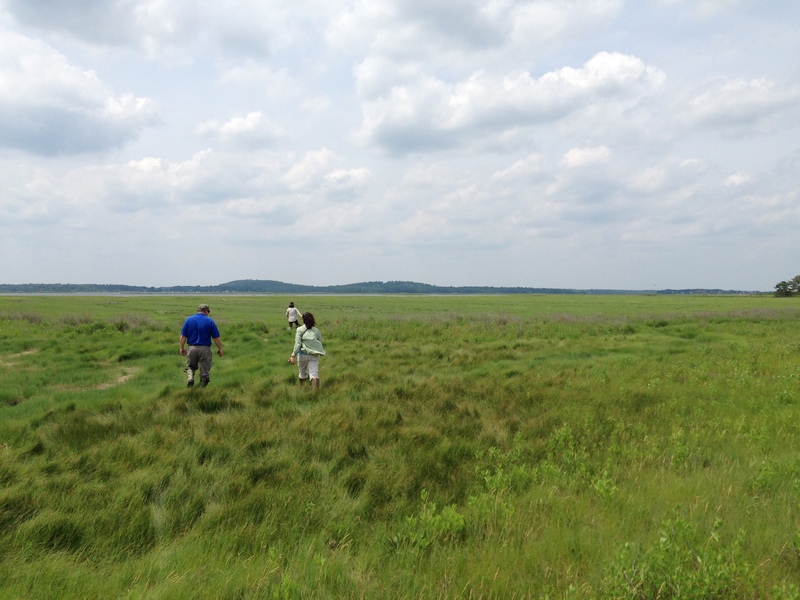 Fish and Wildlife staff discussed the various projects underway at the expansive 3,000-acre portion of the Great Marsh in Newburyport, Mass., adjacent to Plum Island. The roots of agriculture run deep in northern coastal Massachusetts history. 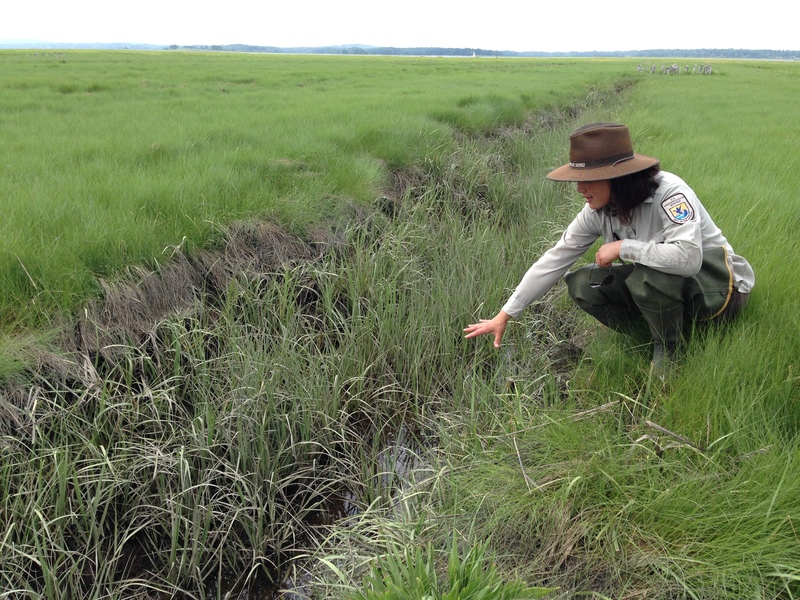 While conducting a tour of the project sites, Nancy Pau, wildlife biologist at Parker River Refuge, points out man-made ditches that dominate the landscape. She explains that as far back as colonial times, salt marshes were heavily ditched by farmers to promote salt marsh haying. More recently, in the last century, they were ditched to control mosquito populations. Ditch remediation techniques include use of a hand push mower in the marsh to cut salt hay vegetation. After cutting, the cut hay is raked into the ditches and held in place by baling twine. Another benefit of the Refuge’s salt marsh restoration project includes controlling large outbreaks of invasive species. 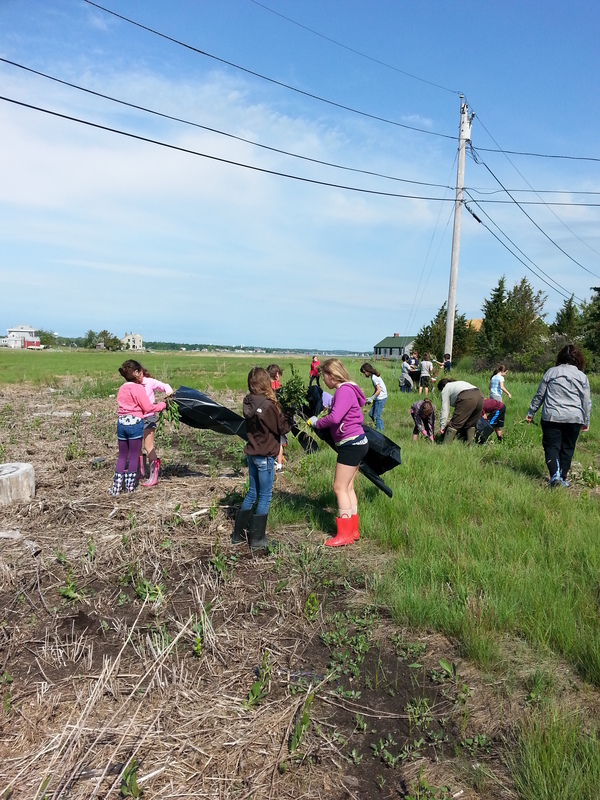 Since 2006, hundreds of students and local residents have donated thousands of volunteer hours to fight perennial pepperweed from Gloucester to Salisbury. Groups are focused on pulling or spraying pepperweed and controlling phragmites, two invasive plants that outcompete native salt marsh grasses which help to filter stormwater pollutants, prevent storm damage, and provide habitat for fish and wildlife. Pau reports that there has been a huge decline of pepperweed in the Great Marsh over the past few years, and welcomes increased funding to eradicate this invasive from much of the Great Marsh. 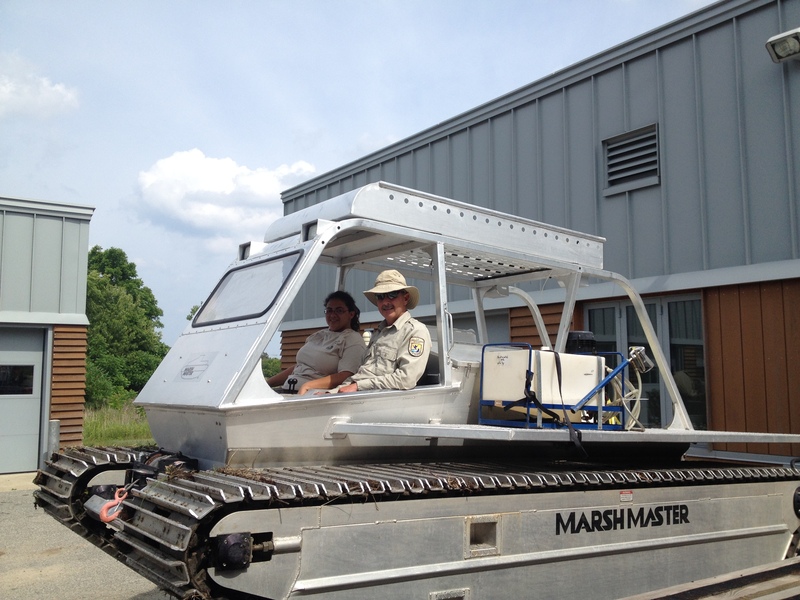 Looking ahead, additional Sandy-funded projects will continue to research and apply new techniques that will strengthen and sustain a healthy salt marsh. Another project restores native maritime forest, a dense shrub habitat that provides shelter and food for migratory songbirds. Pau says that maritime shrub and grassland restoration projects are slated for the North Pool field near the North Pool impoundment on the refuge, as well as at Stage and Nelson Islands nearby. Refuge partners were awarded an additional $2.9 million in Sandy funding in June 2014 through the Department of the Interior, managed by National Wildlife Federation to expand on Refuge funded projects. In addition to expanding invasive species control, the partner project will protect coastal communities along the North Shore of Massachusetts from storms and flooding by strengthening the natural barriers upon which those six communities depend. These complementary efforts, supported by existing and emerging science to better understand the complex yet elegant nature of this fragile ecosystem, will help strengthen the Great Marsh against future storms and keep it great for the benefit of generations to come. The U.S. Fish and Wildlife Service has been working to repair and restore refuges and public lands on the Atlantic coast since Hurricane Sandy impacted them in October of 2012. To learn more about the Service’s ongoing efforts to facilitate habitat recovery and build coastal resilience that helps protect communities, please visit www.fws.gov/hurricane/sandy. This entry was posted in Blog entries, Coastal Restoration, Strong After Sandy and tagged #StrongAfterSandy, coastal, Hurricane Sandy, Hurricane Sandy resilience project, Massachusetts, national wildlife refuges, parker river, Parker River National Wildlife Refuge, salt marsh, The Great Marsh, wetlands on July 17, 2014 by margiebrenner.